Celebrated as the pinnacle of luxury, Capella Lodge rests above romantic Lovers Bay and features nine individual and private suites, providing the perfect setting for a romantic couple’s escape or a honeymoon retreat like no other. Contemporary architectural design in the Lodge’s main area featuring floor to ceiling glass creates an elegant indoor-outdoor space that mesmerises guests with the views of the mountains and turquoise lagoon that stretches to the horizon. Luxurious surroundings, designer fabrics and bespoke furnishings create a feeling of relaxed sophistication and streamlined indulgence. Days at Capella Lodge can be spent lounging with a book in the well stocked library, enjoying the horizon pool or indulging in one of the signature spa treatments at Capella Spa. For the more active, there is an abundance of rare birds, plants and marine life to discover as well as rainforest treks, walks on the sublime beaches and exploring the underwater world by snorkelling or aboard a glass-bottomed boat. Capella Lodge also revels in its reputation for fine dining, boasting a spectacular restaurant that features views of the Tasman Sea below, providing a dramatic backdrop for savouring fresh island cuisine over a romantic dinner for two or perhaps even a proposal? Each of the nine contemporary suites have been designed to complement Lord Howe’s pristine natural environment and each provides a private, luxurious and serene sanctuary for guests. 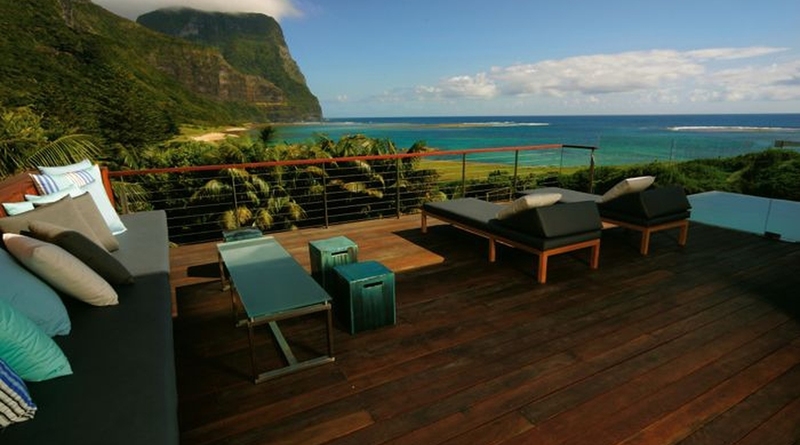 Capella is the only Lord Howe Island accommodation with ocean, lagoon and mountain views. Hosting no more than 20 guests, spacious suites complement the serenity and pristine natural environment and provide luxurious refuge in sophisticated beach-house style. Designed for couples, the single level Capella suites feature timber floors, beach house inspired interiors, king or twin beds and an expansive outdoor deck area with sumptuous day bed. The spacious single level Catalina Suite has a king bedroom (twin bed option available) and separate day lounges that convert to 2 single beds on request. This suite also features an extensive outdoor deck and daybed. The Lagoon Lofts are mezzanine style suites with a king bedroom upstairs that has a private deck and stunning views. The lower level offers a relaxed living area with daybeds that covert to 2 single beds as required, and wide doors that open to an outdoor deck that also has a daybed. The Makambo Loft is a premium mezzanine suite with mesmerising views from the private verandah of the spacious upper level king bed room. The ground level living area features daybeds that convert to 2 single beds as required and extended decks include a plunge spa for ultimate relaxation. The superlative Lidgbird Pavilion is a favourite for those celebrating a special occasion. A generous upper level features a king bedroom opening to wrap around verandahs while the ground level has a banquette lounge and private outdoor area that features a plunge pool, extensive decks, and a luxe daybed.